At 18, Julie Monson had a lifetime ahead of her. She was enrolled at community college. Attractive and fun-loving, she attracted attention and had a close-knit group of friends. The Citizen, March 13, 1986. Thomas Bianco is found guilty of murder. After a night of drinking with friends, Julie left her friends at The Stockade, a local bar, and drove her parents’ red 1981 Chevette up Prospect Street, where witnesses say she was flagged down by another car and pulled to the side of the road. Julie and the driver of the other car — a dark-haired man — spoke, the man appearing to look under Julie’s car. Then the two climbed into the man’s car, and drove away. It was between 2:30 and 3 a.m. Sept. 27, 1981. Julie was never seen alive again. Her killer is still at large. Over the ensuing 30 years, no story has tormented the Auburn community more. Police and Julie’s family used every avenue available to find her, canvassing neighborhoods, retracing steps, even calling for the help of psychics. After her body was found nearly 18 months later, in a wildlife refuge, a jailhouse informant led police to arrest and convict Thomas Bianco, who briefly dated Julie, of murder. But that conviction was overturned, as an appeals court judge tossed Bianco’s conviction, after finding District Attorney Paul Carbonaro withheld 30 lines from police reports — lines which incriminated another man, an ex-convict named John Grossman. 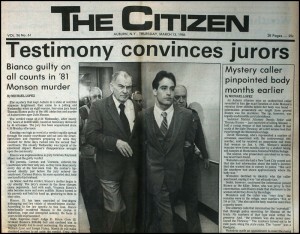 James Vargason, who succeeded Carbonaro as DA, decided against retrying the case, and identified Grossman as the prime suspect in 1993. Since then, DNA evidence has been sent for analysis to the FBI. There have been no further arrests. The Monson murder case is often spoken of throughout this small city of about 25,000 as an example of corruption, misconduct and justice denied. It is grist for the rumor mill that grinds unceasingly as years become decades, and as those years pass, rumors become accepted fact. Witnesses’ deaths seem evermore suspicious. Justice seems so much further from reach. 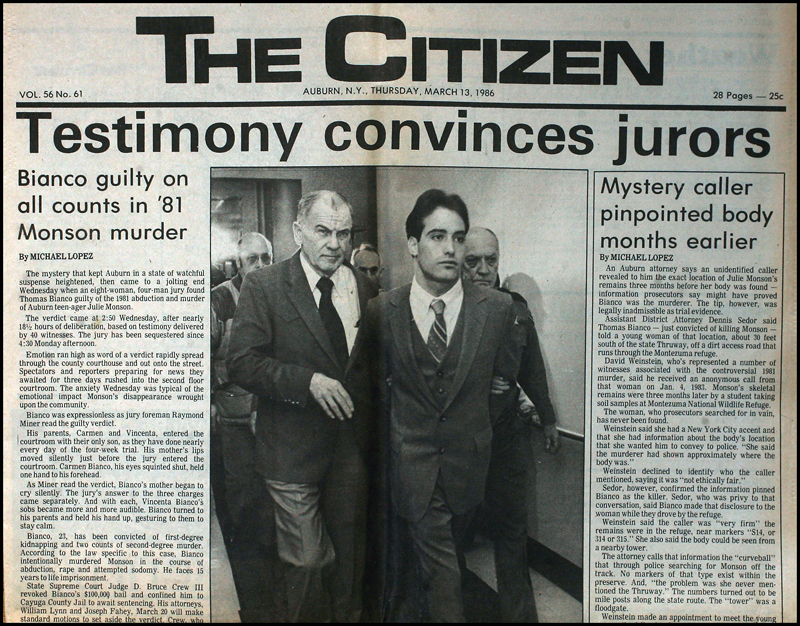 This website is dedicated to making an exhaustive study of the Monson murder case, by exploring the facts, rumors and opinions that have so long clouded this proud and historic city.